As promised earlier, yesterday Facebook disabled all unapproved apps. We are guessing they received several billion complains right after that. That forced Facebook to back down a little bit. 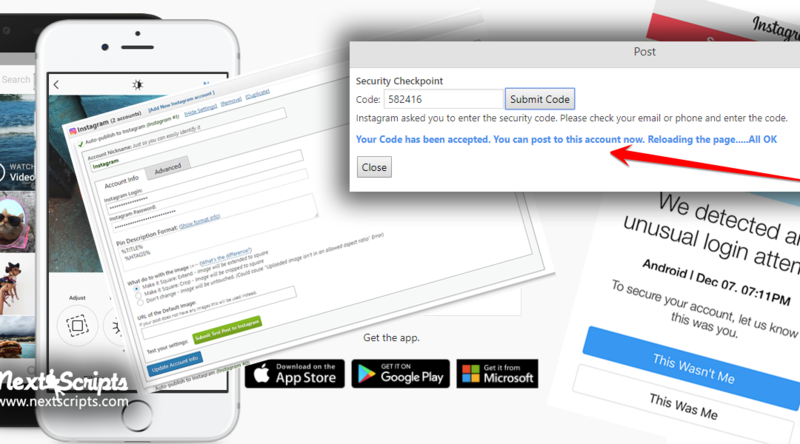 Today, August 1, is the deadline for apps to begin this app review and maintain access to the Pages API, Groups API and extended permissions for Facebook Login. We are enforcing this deadline by shutting off access to the APIs above for those apps that are inactive (have not made Graph API calls in the last 28 days as of July 31). This means, if you want to maintain your API access, please submit for app review through your app dashboard. To avoid disruption, apps that are considered active (have called the Graph API in the last 28 days) will not be deactivated. Instead, we have decided to proactively enroll these active apps into the app review process in the coming weeks. Developers will be notified if the app review team needs additional information to complete the app review process. Any notifications will be sent within your app dashboard and via email, please check there for additional guidance on the actions you need to take. All active, but still unapproved apps that were suspended yesterday were re-activated. SNAP works fine with such apps. 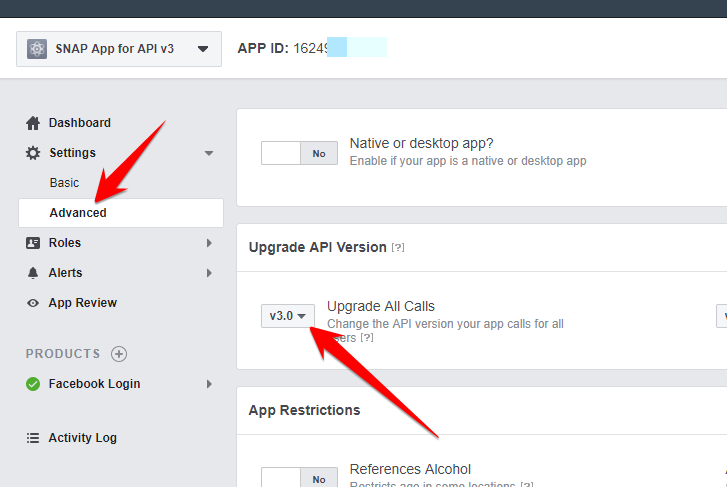 API 4.3.9 adds NextScripts Premium API for Facebook. Facebook officially closed unrestricted access to its API. That was inevitable and it finally happened. Facebook officially closed unrestricted access to its API. Public Mode — Apps in public mode no longer allow their admins, developers, or testers to access permissions or features that normally require app review. This affects all apps built after May 1st, 2018, immediately. Apps built before then will not be affected until August 1st, 2018. This is exactly what SNAP was using for the last 6 years. App admins were able to post to their own profiles, pages and groups without any app review and approval from Facebook. Facebook just put an end to that. All apps created on or after May 1st 2018 require app review and approval to be able to post. All apps created before May 1st 2018 will stop working on August 1, 2018. Now What? / What’s next? 2. SNAP was always based on the idea of making 100% white-labeled posts. We never wanted to act like a middleman between you and your accounts. 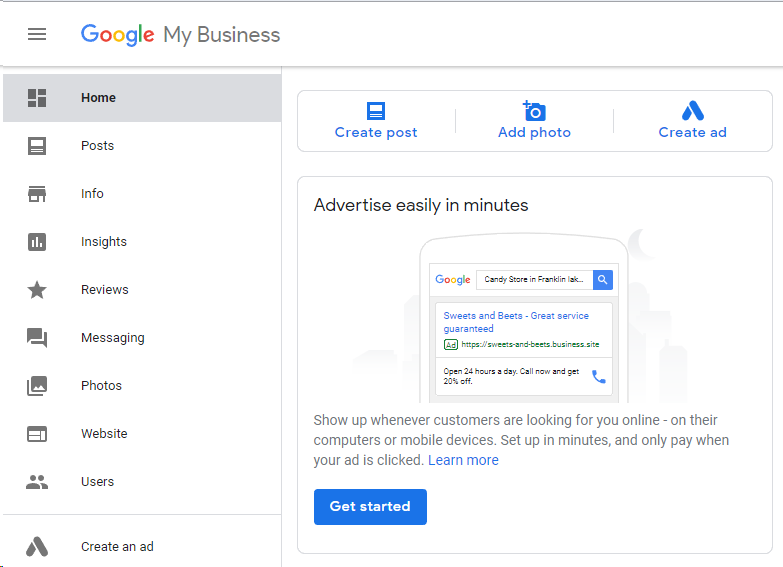 You sites post directly to your accounts using your own apps. Now we will investigate the possibility of creating a service that will act as a middleman. We are not sure Facebook will agree to that, but we will try. 3. Facebook reviewed and approved apps should be working fine with existing plugin code. 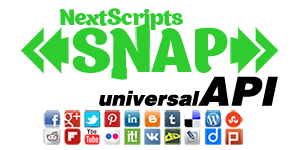 We will try to submit several apps to Facebook for review and we will see if Facebook approves them. If they do, we will create a guide and update our instructions. How to check if my app was created before or after May 1st, 2018? You can also open your App Setting -> Advanced page and look at the version. If it says 3.0, your app will not work without review and approval. 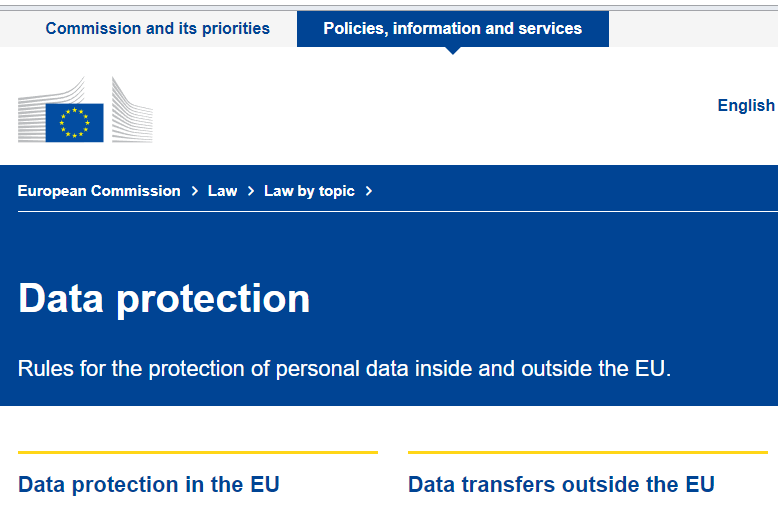 Since everyone is worried about GDPR Compliance this days…. SNAP WordPress Plugin is 100% GDPR compliant. SNAP does not collect any visitor’s data. SNAP does not collect any admin’s data automatically. SNAP does not set any cookies. SNAP does collect some admin’s or authorized user’s account data entered manually by admin or user. Admins/Users can see all of their data on the “Accounts” page. Data is encrypted (where necessary) and stored in the WordPress Database. Button that allow admin/user to download all his/her data is located in the “Accounts” page. Button that allow admin/user to delete all his/her data is located in the “Help/Support” page. it looks like another free native API is biting the dust. Joining the trend from Xing, Scoop.it and Facebook image sharing website 500px is shutting down its API. In January, we removed public access to our API. 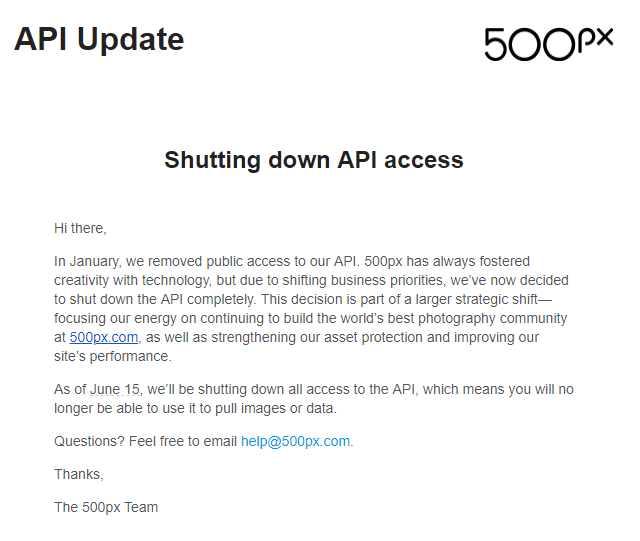 500px has always fostered creativity with technology, but due to shifting business priorities, we’ve now decided to shut down the API completely. This decision is part of a larger strategic shift—focusing our energy on continuing to build the world’s best photography community at 500px.com, as well as strengthening our asset protection and improving our site’s performance. As of June 15, we’ll be shutting down all access to the API, which means you will no longer be able to use it to pull images or data. We will consider the possibility of creating our own API for 500px. Original NextScripts Premium API for Facebook came out only with support for autoposting to Groups. Today we are releasing full featured API. Autoposting to pages (All types). If you are an admin of the page, posts will be made as “page name”. Autoposting to groups (All types). Available today as Beta to all active Premium API subscribers and prepaid users. Please update SNAP plugin to version 4.2.3, API to version 4.3.6 and SNAP Upgrade helper to version 1.5.5. 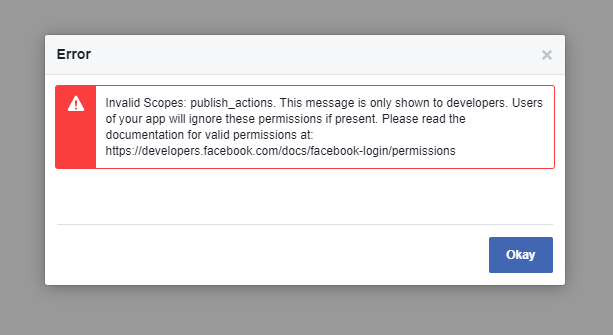 Facebook Error: Invalid Scopes: publish_actions. All new Facebook applications (created today – Apr 25, 2018) can’t be authorized with publish_actions permission. Facebook just complitely broke an ability to post through its native API. All apps that were created before today are still working fine and can be authorized without any new issues. All apps created today show this error during the authorization: “Invalid Scopes: publish_actions. This message is only shown to developers. Users of your app will ignore these permissions if present”. publish_actions is a permission that allows Facebook apps to create posts on Facebook. Since this permission is no longer available to new apps, it basically means new apps can’t post there anymore. At this point we don’t know if its a bug or Facebook deliberately turned off an ability to post through its API. They provided no info about that (as usual). [Update] Facebook published an explanation. 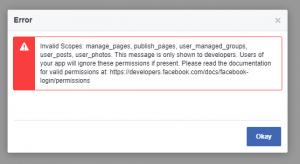 This means that they have officially closed an ability to publish to user profiles through the native Facebook API. If your app was created AFTER April 24, you need to use the top link “Authorize Your Facebook Account without “publish_actions””. The other link will cause “”Invalid Scopes: publish_actions” error. 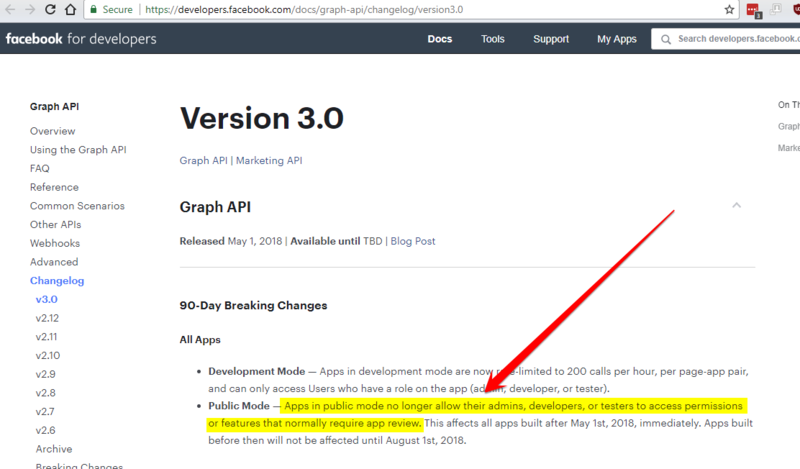 [Update 3: May 1st, 2018 (Facebook released API v3.0) ] Facebook officially closed unrestricted access to its API with API v3.0 release. PS: Premium NextScripts API for Facebook has full support for publishing to profiles, pages and groups. 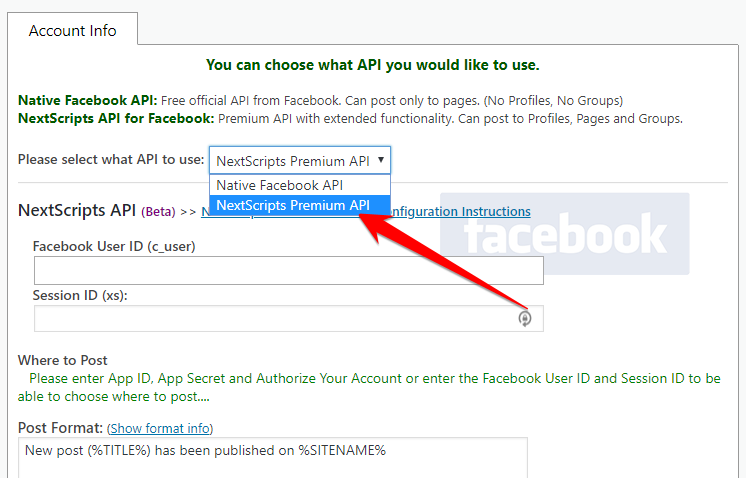 NextScripts API for Facebook is joining NextScripts Premium API family. Official native Facebook API was going downhill for quite some time. It used to work fine and it had all necessary features, but during the last year it lost a lot of functionality. – Setup become extremely over-complicated. Facebook setup instruction has 16 steps. Facebook “Common Problems” FAQ section has 22 items. – Ability to set Image, Title and Description for shared links has been removed, forcing only usage of OG meatatgs. – Ability to post to Closed and Secret groups for non-admins has been removed. – oAuth login callback URL field become mandatory, complicating setup. – oAuth “Strict Mode” become mandatory, complicating setup even further. – Ability to post to open groups has been removed for non-admins. – “Enforce HTTPS for Web OAuth Login” setting become mandatory, forcing all sites to switch to HTTPS. 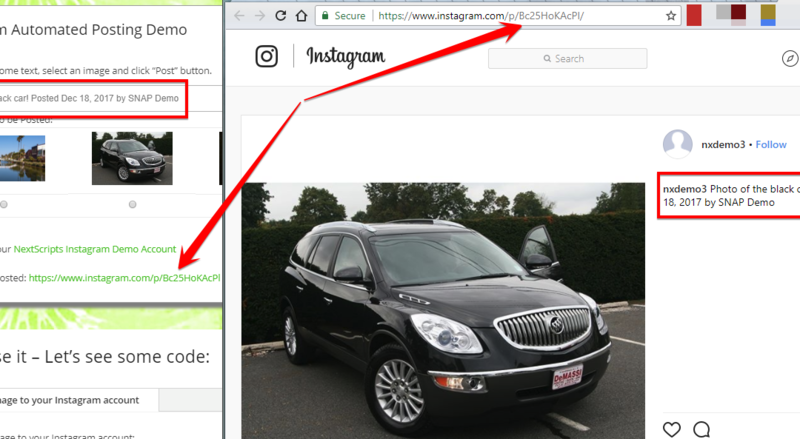 – Ability to post to pages as “Page Name” has been broken. All post are made from user’s name and go to the community section. – Ability to post to Groups has been disabled complitely. Basically official native Facebook API become very restricted, very hard to setup and very limited. It’s time to have an alternative. 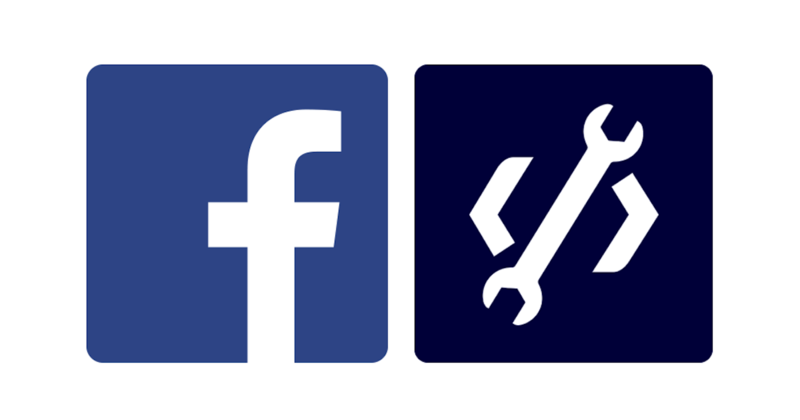 NextScripts API for Facebook could be used to replace official native Facebook API. It has none of the restrictions listed above. Available today as Beta (supports only Autoposting to Groups) to all active Premium API subscribers and prepaid users. Please update SNAP plugin to version 4.2.2, API to version 4.3.3 and SNAP Upgrade helper to version 1.5.5. This page was updated on May 3, 2018. Facebook recently became a major troublemaker for the SNAP. It started with the release of the very buggy and unstable Graph API 2.12. The first thing it broke is the ability to post to pages as “page name”. Posts were posted as personal name and went to the “community” section of the page. Facebook acknowledged the bug and tried to fix it. As of today it’s fixed for most users, but some are still experiencing it. More info about that here. Graph API 2.12 also removed the ability to post to any groups (even public) where you just a member. Only admins can post to groups. Graph API 2.12 also tightened up security basically forcing people to switch sites to https (ssl) protocol. It came in form of “Insecure Login Blocked: You can’t get an access token or log in to this app from an insecure page. Try re-loading the page as https://” error. More info about that here. To make things worse (much worse) right after the release of already unstable Graph API 2.12 Facebook got hit with now famous “User’s data leak” issue. Data got leaked through the misuse of API apps, so Facebook started to shake it down. Right now all apps are getting reviewed and checked for undesired activities. As the result platform become unstable to almost unusable level. Many apps just randomly stop working partially or completely. Some apps lost an ability to be authorized, some can’t post to groups anymore, some can’t post to pages, some apps are getting temporarily disabled. (#200) The user has not authorized the application to perform this action. 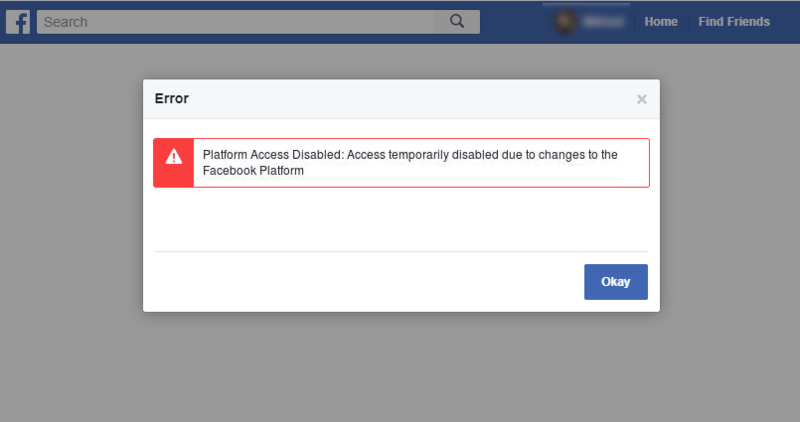 Platform Access Disabled: Access temporarily disabled due to changes to the Facebook Platform. As this wasn’t enough Facebook issued a new statement announcing the end of some API features used by SNAP. It looks like starting today Groups are no longer available though the API at all. It’s also unclear what will happened to pages. [April 25, 2018] publish_actions permission has been disabled. All new Facebook applications created after Apr 25, 2018 can’t be authorized with publish_actions permission. More info about that here: Facebook Error: Invalid Scopes: publish_actions. [May 1, 2018] End unrestricted access to Facebook API. Facebook officially closed unrestricted access to its API. All apps created on or after May 1st 2018 require app review and approval to be able to post. All apps created before May 1st 2018 will stop working on August 1, 2018. More info about that here: Facebook officially closed unrestricted access to its API. 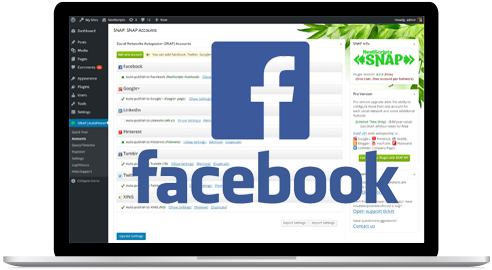 [UPDATE]: Full featured NextScripts API for Facebook has been released. It has all features that Facebook removed from its native API including the ability to post to profiles, pages (as page name), and all kinds of groups (open, secret, closed).